I feel as though we’re getting there with preparing for Blueberry, or little Lavinia as my Granddad has dubbed her! Just before Christmas, when at my lovely mother-in-laws, we got early online access to the Mothercare sale. After a visit to her local Mothercare store, nearly £600 later and we’d bought our pushchair, with car seat, cotbed, with mattress, bedding, cot top changer, and a changing mat. I know the changing mat doesn’t match the bedding, but Chris fell in love with the whale set, but decided having everything in that pattern seemed a bit too boy-ish, so the bedding set we chose was quite neutral. I also bought myself a couple of pairs of maternity jeans (bought both size 10 and 12) and a lovely dress. Unfortunately the size 10 jeans were a bit optimistic so got returned, as did the dress – although it fit very nicely (and was a size 10), the neck line sat really strangely and seemed wonky. We got fantastic discounts in the Mothercare sale, and saved probably nearly £250-300! Our excitement was short-lived however, as we’d had a text message sent through saying our order would be delivered that day….we’d already left for my parents for Christmas. 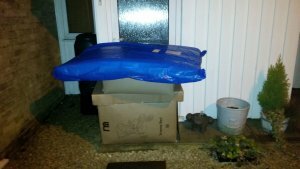 We returned home 4 days later to find everything but the cotbed (which was being delivered separately) sat on our doorstep. Thank you very much Yodel! 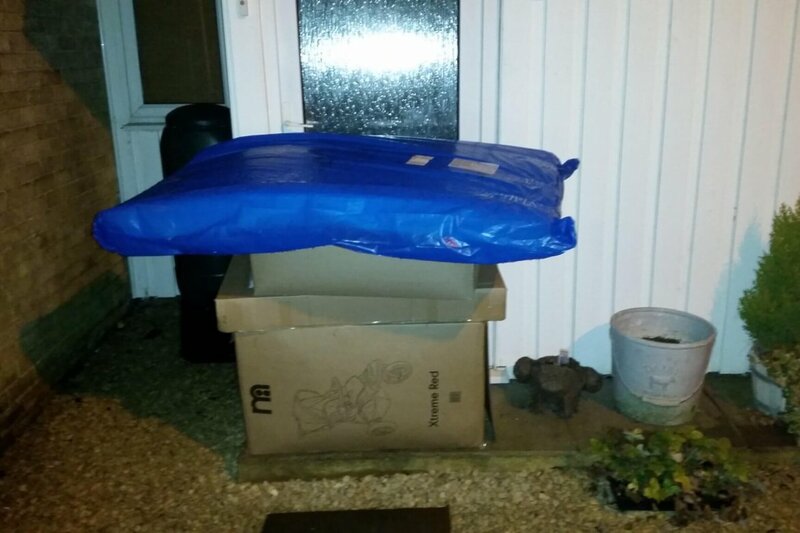 Thankfully nothing had been stolen, but there was over £400 worth of stuff that had just been left there for days, in the rain! As Mothercare package their things well, nothing had been damaged by rain either, but the cot top changer looked as though it had been thrown around during delivery, and had quite a few dents and scratched on it. This has been replaced now, but I really wasn’t happy! Our cotbed was delivered, with the only problem being uncertainty as to when it would arrived. I’d had to book a day off work for it, but the company delivering wouldn’t provide any text or email confirmation of the delivery date, but promised a text the night before with a time frame of when it would be delivered on the day. Surprise surprise I didn’t get a text. After stressing all night, and the next morning, I phoned the company (after searching through my phone logs to try to figure out who they might be) and they said their text system must have been down the night before, but it should be there within 3 hours. Thankfully it was, and the delivery guys carried it up to the nursery for us too. We finally got round to putting it together this weekend, with the help of my Mum, and are so happy with it. We also ordered our moses basket and stand this weekend, which is exciting. Having bought nothing but a pair of teeny tiny socks prior to Christmas for Blueberry we has bought a fair few things, and also received quite a few things now from friends and family over Christmas so feel we may actually be able to clothe our little one for a while now, and be vaguely prepared for when she arrives! We had a huge clear out after New Years of a lot of areas of our house in preparation for Blueberry’s arrival. We have thrown loads of stuff out, and also taken 5 bin bags full of things to the charity shop. Mum and Dad were down this weekend – a last-minute change of plans as they were meant to be coming at the end of the month, but this was changed on Thursday night! The weather was bitterly cold, and both Chris and I seemed to have picked up some sort of bug on Saturday so we didn’t really venture outside at all, beside me and Dad going for a quick walk round the village for some fresh air, and Chris and Dad nipping down to the allotment to take some carpet down there, and get some large screws out of the shed, as well as dinner out in Marlow on Sunday evening as a pre-celebration of Chris’ exam results which came through at midnight (yay, he’s passed, no more exams!!! He’s soooo nearly qualified now!) So our weekend was spent doing little jobs round the house which mum and dad helped us with. Mum made me sort through stuff that I have no motivation to do, but meant that downstairs at least is a lot tidier. Dad helped Chris sort out our bathroom sink, which didn’t want to drain very well, as well as looking at our back gate that has died a little bit. Although it didn’t get fixed, we have a plan on how to fix it! We still have a lot more tidying and sorting to do, but we’re getting there slowly. We’ve booked ourselves onto the local NCT course as well. Although these days it costs a small fortune to do, I feel as though these courses are a lot more thorough than the ones provided by the local healthcare trust, and also I think they’re a great chance to make new friends who will be in a similar position to us, which I will find particularly as I don’t really know many people around our area, so it will be great a great opportunity for me to meet new people. I’m particularly keen on their support round breastfeeding. I’ve never heard anything positive about midwives support on the maternity units in terms of their help with breastfeeding, so I’m glad we have a 3 hour session on breastfeeding. My mum was also an NCT breastfeeding counsellor for years, so it’s nice to know I will have her on hand should I need it, and hopefully there are breastfeeding counsellors still available for extra support should I need it. We’ve got about 14 weeks to go until Blueberry is due, which I’m sure will fly by. I’m feeling vaguely prepared now, but I’m sure the closer we get I’ll start panicking about all the things that need doing, or that we haven’t got yet, and that it’s all happening so quick! But for now, I’m feeling excited, and although I do often feel like my belly is getting bigger by the day, some days I still just feel that I look fat rather than pregnant! I’m sure I’ll completely explode soon!